What could be a more romantic combination than candlelight and a bottle of wine? It was designer Craig Davies' inspired idea to combine the two. Craig gathers and cleans discarded wine bottles, then cuts them down by hand to be unique vessels for his eco-friendly, long-lasting soy candles. 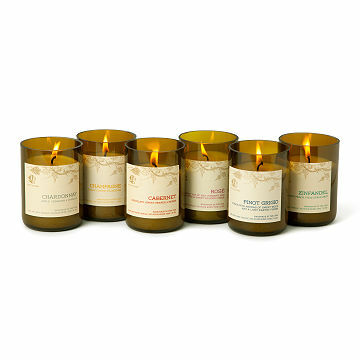 The hand-poured candles are scented to evoke classic wine varieties: Cabernet is dark and sweet, like cherries and chocolate, with an herbal finish; Champagne has a fresh, crisp aroma with hints of cotton blossom; and Chardonnay has aromas of apple, almonds, and cinnamon on top, with buttery richness underneath. Rosé has fresh fruit and sweet almond notes. Pino Grigio is airy with a hint of citrus and sassafras wood. Each one is like a toast to a special person or unforgettable milestone, lingering in the senses long after the moment has passed. Handmade in Truckee, California. I'm giving my boyfriend's family a nice personalized gift for Christmas and I didn't want his sibling's SO feel left out. From what I know, homegirl loves wine. So it's a basic gift but also thoughtful. Made a great gift for my champagne loving friend. Makes a great gift, very attractive and a great cause. I love these candles! I have purchased several scents and they have all had the most amazing aroma. Out of these three scents Cabernet is probably my favorite. They are gorgeous and their burn is high quality. You won't be disappointed.